An electrical network is the lifeblood that drives business operations. Network operators and plant managers face a two-fold problem: maintaining their networks to ensure uninterrupted power while dealing with budget cuts, problematic environments, and safety concerns. Cost-cutting often leads to reduced maintenance team strength and taking an on-demand approach to repairs – which can result in risky maintenance planning. In fact, the principal reason for electrical system failure is lack of maintenance. All electrical equipment requires regular maintenance to optimize operations, avoid breakdowns, and ensure safety. To further complicate matters, the design of many existing electrical infrastructures simply can’t support ever-increasing workload demands. Add to that faulty components and heavy equipment usage, and your maintenance program – or lack thereof – can hinder the performance and life expectancy of your electrical system. The question is not if a failure will occur, but when. Electrical equipment failure rates are three times higher for components not covered by a scheduled maintenance program, as compared to equipment under a service plan, according to a study published by the Hartford Steam Boiler insurance company. Bottom line: Your repair costs may be low, but risk of losses that can impact your business is high. Bottom line: A structured, planned maintenance program can help you optimize equipment lifespan, control the total cost of ownership, and safeguard human life. Step 1: Record the number of electrical breakdowns and their impact over the past 5-10 years. 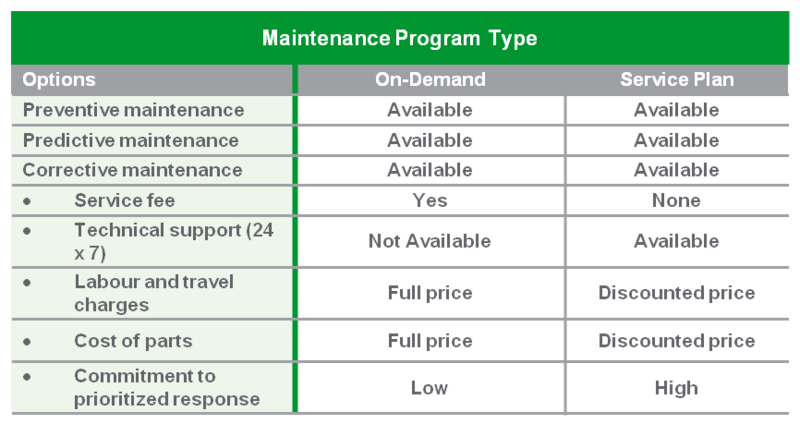 Quantify the amount of money spent on correcting electrical faults through on-demand maintenance. Step 2: Contact the electrical equipment manufacturer and request a service plan customized to the nature of the business. The plan should guarantee emergency on-site intervention and delivery of spare parts for immediate corrective action in case of a breakdown. Investing in a service plan enables you to avoid up to 67% of potential electrical breakdowns and associated financial losses. Service plans reduce overall maintenance expenses and also prolong the lifespan of electrical equipment. The number one consideration, of course, is carrying out preventive maintenance as originally scheduled. But this might conflict with the whole grid’s standby reserves and running reserves. In order, therefore, for the grid to have sufficient reserve and for power plant preventive maintenance carried out as scheduled, utilities companies must constantly review – preferably on a quarterly basis – their power development program in coordination with appropriate governing agencies namely: economic, which to me is the number one consideration; environmental, and last but not the least, the type of power plant, i.e. hydro, coal or nuclear, etc., to be put up as programmed in their long or short term development plan; so power plants can be erected on time and in-step with economic growth that would translate to higher electric energy demand. Likewise, all of the proposed plants associated transmission lines and substation including its projected cost should have also been predetermined. Hi Ares, thanks for your comment, we surely understand the criticalities involved in the maintenance when it comes to power plants and places similar to them. However, when the power plant is part of a maintenance program, the on-site operational staff is contacted before-hand. They are informed about the status of their installed electrical system. They can then agree on a date depending upon the type of service contract they have with the provider to perform the needed maintenance. This date is made flexible taking into account all the factors associated with the nature of business. Schneider Electric relies upon its field experience of several years to customize every maintenance program according to client’s business needs, Denis. This is a very helpful to advance my knowlede skill. This is some really good information about electrical service. It is good to know that you need to maintain your electrical system. That is good for me to know as a new homeowner. It seems like I should get my system checked soon.